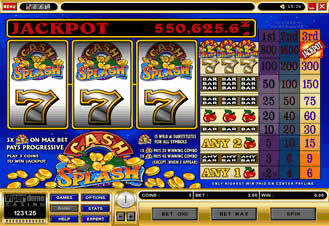 Cashsplash progressive slots are found at all Microgaming Casinos. With 3 rows, 3 reels, 1 pay line and 1 spin. You can bet 3 coins to be eligible for the pregressive jackpot. When you get 3 Cash Splash symbols on the pay line you win the progressive jackpot!! You only have to put in a minimum of $0.50 , up to a maximum of $1.50, The only thing that this progressive jackpot slot machine doesn't offer are bonus games. Cash Splash symbols are also wild with a slight bonus. Cash Splash symbol completes the winning combination, paying the normal winnings times 2. Cash Splash symbols complete the winning combination, paying the normal winnings times 4.